It’s looking like another banner will be hung in the gymnasium for Boulder City High’s boys and girls swim programs this season following first-place team finishes this past week at the Division I-A Southern region meet at UNLV. For the Lady Eagles, it was dominance as usual for head coach Sara Caroll’s unit, racking up an overall team score of 523 points, with Clark their next closest competitor with 252. Setting the tone for the Lady Eagles, junior Montana Lloyd placed first in the 100-yard backstroke and 200-yard individual medley with times of 56.03 seconds and 2:04.84, respectively, breaking her previous record in the backstroke and setting a new regional record in the individual medley. Falling in line with her junior teammate, Lloyd wasn’t the only Lady Eagles’ competitor to sweep her way through her events, as Mandy Gebhart placed first in both the 50-yard freestyle with a time of 24.87 seconds and in the 500-yard freestyle with a time of 5:01.86, while freshman Rose Pouch placed first in the 100-yard freestyle and 200-yard freestyle with times of 53.51 seconds and 1:54.24, respectively. Junior Abby Sauerbrei also placed first for the Lady Eagles in the 100-yard butterfly event with a time of 58.90 seconds, while Sarah Estes placed second in the 100-yard freestyle and in the 100-yard backstroke with times of 56.23 seconds and 1:00.72, respectively. In a nail-biter that went down to the wire Friday, the boys were able to hold off a strong push from Sierra Vista to capture the team crown with an overall score of 342 at UNLV. Like Lloyd, who was awarded regional honors as swimmer of the year for the Division I-A Sunrise League, senior Nick Lara was at his best Friday, placing first in the 100-yard butterfly and 200-yard freestyle with times of 51.13 seconds and 1:41.96, respectively. Also placing first for the boys was the freshman duo of Paco Cuevas and A.J. Pouch, who both capped off phenomenal freshman campaigns with state-meet berths. 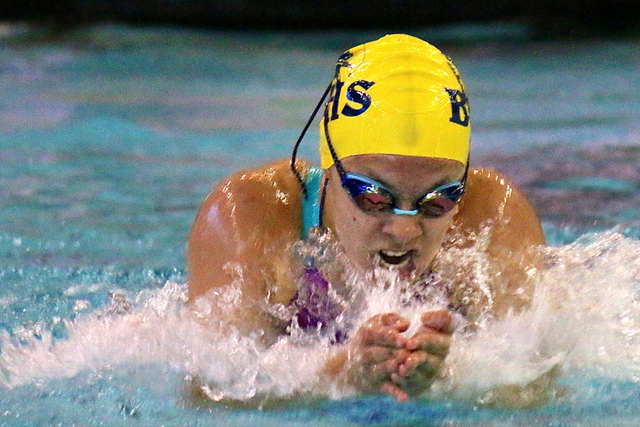 Cuevas, placed first in the 200-yard individual medley with a time of 2:03.25, while Pouch placed first in the 100-yard breaststroke with a time of 59:03 seconds. 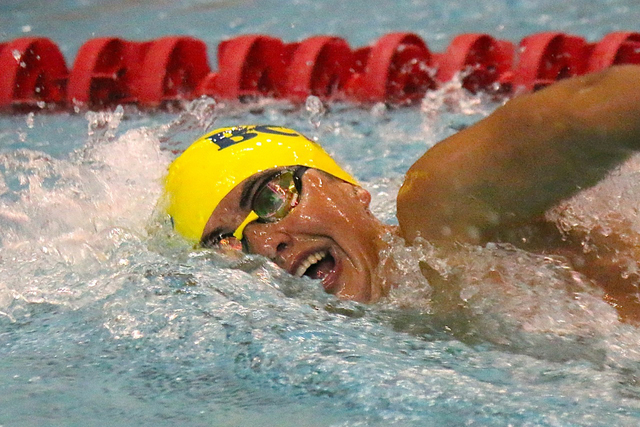 Cuevas also finished third in the 100-yard butterfly, while Pouch finished second in the 500-yard freestyle. Rounding out a valiant effort for the boys, junior Braden Klouse finished second in the 100-yard freestyle and fourth in the 200-yard freestyle, while senior Joren Selinger placed third in the 200-yard individual medley. With the Division I-A state meet looming Saturday at UNLV, Carroll is confident in both programs to repeat as state champions, but said the road will be tough for both teams. This year’s state meet will begin at 11:45 a.m. Saturday.